Before the visiting Philadelphia Eagles kick off against the Seattle Seahawks Sunday night at CenturyLink Field, they have a chance to clinch the NFC East. If the Dallas Cowboys lose at Washington Thursday night, the Eagles (10-1) will have already captured the division with five games remaining. The surging Eagles are winners of nine straight games and will look to make it 10 in a row against the Seahawks (7-4), who are battling to remain in playoff contention. Philadelphia already owns the best record in the league and is the only team to score at least 20 points in all 11 games this season. 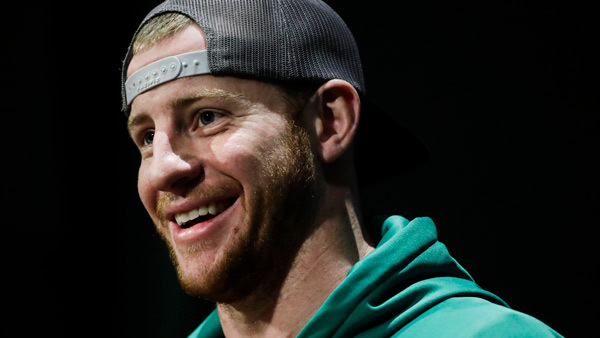 Much of the offensive success has to be directly attributed to second-year quarterback Carson Wentz, a legitimate Most Valuable Player candidate. Wentz is 213 of 354 (60.2 percent) for 2,657 yards, 28 touchdowns and only five interceptions. Wentz is just the third quarterback in league history to throw at least 28 touchdowns and no more than five interceptions through the first 11 games joining New England's Tom Brady (2007, 2015) and Green Bay's Aaron Rodgers (2011, 2014). Wentz has also thrown multiple touchdowns in seven straight games, which is now tied for the longest streak in Eagles history. Wentz's 28 touchdown passes ranks fifth in Eagles history behind Sonny Jurgensen (32 in 1961), Donovan McNabb (31 in 2004), Randall Cunningham (30 in 1990) and Norm Snead (29 in 1967). If you are a true Philadelphia Eagles fan, you bleed green...even if you are in Dallas. Wentz still has five games remaining. "We're obviously pleased with where he's at currently with the growth, but listen, every game is a new game for him and it's a learning experience," Eagles coach Doug Pederson said of Wentz. "I think he can get incrementally better. There's still things that show up on tape where he can make a better decision, playing the quarterback position. He makes a lot of great decisions, don't get me wrong there. But I think he can continue to get better and continue to help this football team win games." It's not just offense that has sparked the Eagles. Their defense has been special as well. The Eagles have allowed a miniscule 716 rushing yards, the fewest allowed through 11 games in team history. In last Sunday's 31-3 victory over the Chicago Bears, the Eagles gave up just six rushing yards. What's the secret to this success? "They're professionals," Eagles defensive coordinator Jim Schwartz said. "They do a good job of preparing week in and week out. It's a good tackling defense. I appreciate that about them. And I think that has a lot to do with not giving up big plays, also. You combine that with we're a pretty good third down team and it makes it hard for teams to drive and score. Like I said, everybody has got a little different personality. Sometimes you're better at man, sometimes you're better at zone. "Sometimes you need to blitz, sometimes you don't," Schwartz added. "But these guys have had the flexibility to play it however we've needed it, and it's always a little bit different from year to year, but it's also different from week to week." The banged-up Seahawks are still quite formidable at home and at night, going 21-4-1 in Sunday, Monday and Thursday night games since 2010. They're 13-2 at home in prime time under coach Pete Carroll. But Seattle will be without key players such as cornerback Richard Sherman (season-ending Achilles injury), strong safety Kam Chancellor (neck) and defensive end Cliff Avril. "We're really trying to be very respectful of Kam and kind of let him call the shots as far as what is known and all that kind of stuff and how he wants to talk about it because this is him," Carroll told ESPN Radio 710 in Seattle. "It's not us, it's him. And we will support him all that we can." Avril also suffered a neck injury against Indianapolis on Oct. 1. The Seahawks, who usually featured high-powered offense, struggled to score in the first half of recent games. "We continue to have our struggles in the first half," Seahawks wide receiver Doug Baldwin told the Seattle Times. "I don't know what it is. Maybe we have to calm our jitters down and maybe we are overly excited. But once we find our groove obviously we are able to continue and play well." Yet quarterback Russell Wilson continues to play at a high level as he has completed 256 of 411 passes (62 percent) for 3,029 yards, 23 touchdowns and eight interceptions. Wilson has started 91 consecutive games, the fifth-longest active streak. The Seahawks are attempting to reach the playoffs for the sixth straight year. Right now, they're seventh in the NFC playoff race. "It's about staying the course, keeping it steady and running together and just being together in this next part of the season and staying on the grind, because we play a lot of tough games," defensive end Michael Bennett told the Seattle Times. "We've got to play good on special teams, we've got to be good on defense and good on offense. That's the key." Seattle won the last three games against the Eagles, with its last loss coming in 2008.